This plant is sometimes confused with the Marsh Marigold, but the leaves of the two plants are very different: Marsh Marigold has heart-shaped leaves and the Globeflower has the deeply lobed leaves typical of Ranunculus (Buttercup) species. 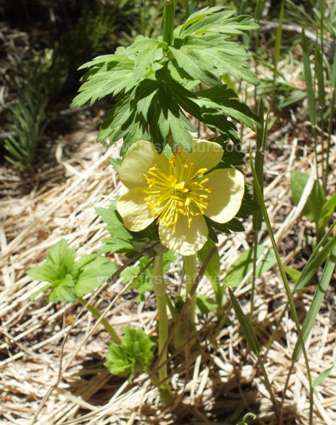 Trollius laxus is one of the first flowers to bloom in springtime in the Rocky Mountains. Although it appears in wet meadows along with Marsh Marigold, it is equally at home in alpine settings and will appear as the snow recedes. The range of Trollius laxus is considerable and it is recorded from Oregon, Washington, British Columbia, east to Connecticut and south through the Rocky Mountains to Colorado. In Britain and Europe Trollius europaeus occurs, although in many countries it is now a rare find. Its flowers rarely open beyong a globe with narrow inter-sepal gaps via which pollinating insects can gain access. The Trollius laxus specimen shown on this page was photographed on the edge of pine woodland high up in Yellowstone National Park.